Alien VoIP with iPhone enables you to use your iPhone to make calls over the internet with SIP client apps from Apple Store instead of traditional mobile operators. You can make cheap VoIP calls anywhere and anytime with access to the internet via Wi-Fi or over 3G/4G. Which iOS device does it work on? Alien VoIP is capable to support mass-market mobile phones. 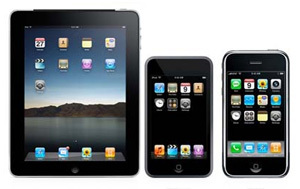 In this case, Alien VoIP can be used on your iPhone, iTouch and iPad. As long as you installed SIP client apps such as Media Fone 5 or Zoiper. Web ASP sdn bhd is ASP license holder with good track record since 2007 and AlienVoIP.com is our flagship VoIP product. We have been providing VOIP /IP-PBX solutions for enterprise with our knowledgeable in-house engineer team. Please contact our team if you need any support to configure SIP client on your iPhone. 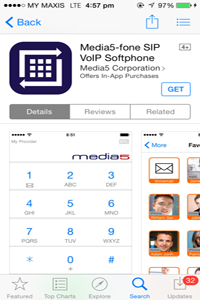 You can search for Media5-Fone in App Store or download from Media5-Fone Website, and install in your iOS products. Then, get a AlienVoIP SIP account with one of the validated SIP Providers and use the Media5-Fone SIP Client to start making and receiving calls all around the world. Enjoy our lowest AlienVoIP call rate right now! Zoiper is a free softphone that is easy to setup in your iOS devices. Zoiper enables you to make VoIP calls through your PBX or AlienVoIP SIP Provider with excellent voice quality. 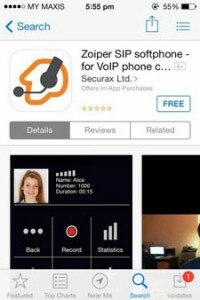 You can search for Zoiper in App store or download from Zoiper Website, and install in your iOS devices.Get a AlienVoIP SIP account with one of the validated SIP Providers and use the Media5-Fone SIP Client to start making and receiving calls all around the world. Enjoy our lowest AlienVoIP call rate right now! 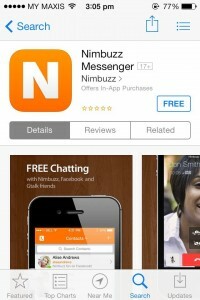 Nimbuzz is providing unlimited free messages and call services for iOS users. You can have free calls to online friends over 3G and Wi-Fi. Moreover, Nimbuzz has cheap international calls to mobile phones and landlines by buying NimbuzzOut credits. You can search for Nimbuzz in App store or download from Nimbuzz Website, and install in your iOS devices.Hurry up! Get a AlienVoIP SIP account with one of the validated SIP Providers and use the Nimbuzz SIP Client to start making and receiving calls all around the world. Enjoy our lowest AlienVoIP call rate right now!